Framura is located at the Ligurian Riviera, at a short distance to the famous Cinque Terre and not far away from the wonderful Portofino. Framura consists of 5 tiny villages (Anzo, Ravecca, Setta, Costa and Castagnola) located on a steep hill connected to another with stairs. This is an ideal location for those looking for tranquility, here you can spend a relaxing holiday away from the tourist crowds. From the station it goes steeply up to the village centre about 300 metres above sea level with a small chapel, a pizzeria and a few small shops. The sea is certainly the most important resource with its crystal waters and small beaches surrounded by huge cliffs. 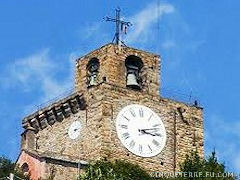 • The Parish Church of San Martino located in the hamlet of Costa, has an interesting square-shaped bell tower, which was originally a medieval watch tower. • In San Lorenzo Parish Church in Castagnola there is a painting representing the Deposition from the Cross by Luca Cambiaso, a famous painter of the 16th century born in Moneglia. • Monte Serro (421 m. above sea level), situated between Framura and Deiva Marina, belongs to the protected area of Cinque Terre. On the rocks overlooking the sea there are some Aleppo pines. Maquis, cluster pines, holm oaks, chestnut trees and other broad leaves cover the northern hillsides. • This part of Liguria has many scenic footpaths surrounded by the Mediterranean vegetation such as vineyards, olive groves, lemon and fig trees. 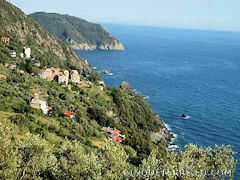 We recommend the walking trail along the coast from Framura to Bonassola which takes about two hours. • You can walk through the old railroad tunnels between Framura and Bonassola which have been newly renovated.